Global warming has reached a level such that we can ascribe with a high degree of confidence a cause and effect relationship between the greenhouse effect and observed warming…It is already happening now. 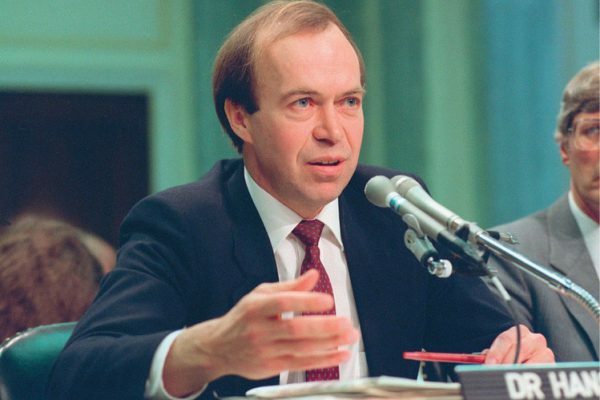 That the U.S. was going through a heatwave during his testimony in what was going to turn out to be hottest year on record—though nowadays 1988 doesn’t even make it into the top twenty warmest years—helped to bring his testimony to national attention. At the time of Hansen’s testimony I was visiting China for the first time, spending a few weeks at an agricultural research institute in Shanxi Province. Before I returned I was asked if I could develop an itinerary for a visiting group of agricultural scientists from the province. I returned to a major heat wave, inducing me to spray water on the metal roof of our Vermont summer home with water in an attempt to cool the house. And it was hot when the Chinese delegation came later in the summer. Our first stop was Iowa State University and area surrounding Ames. The Midwest was in the midst of a major crisis, with low rainfall, high temperatures, and shriveled crops. Income from what crops remained was going to be very low. Farmers were going bankrupt and land prices were low, making things worse as they tried to sell their farms and settle debts. There was such discouragement in the Midwest that farmer suicides became common. A colleague took me to visit towns that had “died” (his words): people still lived in these towns but all businesses and schools and local government offices had closed. They were essentially bedroom communities, people who lived there worked elsewhere and children were bused to nearby towns that still had schools. The summer of 1988 added impetus to farm consolidation, a process that continues today. And here we are three decades later, with little done to try to halt or even slow the changes. More and more record hot years, record melting of the arctic ice in the summer, more rapid melting of the Greenland and Antarctic ice sheets, greater sea level rises and coastal flooding, more intense storms, and so on. How can one explain the lackluster response to what is clearly a global emergency? How can the explanation be anything aside from an economic system completely lacking an ability to take into consideration almost anything except profits? In its monopoly phase, the power of large corporations and billionaires is so great as to be able to overwhelm the public interest if they think it might reduce their profits or flexibility. And the low prices for a number of key agricultural products is causing distress in the Midwest today, though not as great as in 1988. But low milk prices are causing dairy farm bankruptcies. As with the situation for Midwest grain farmers in 1988, today farmer suicides among small to medium size dairy farmers are becoming a concern as they lose or fear losing their farms. Capitalism as a system functions irrationally because social and ecological concerns cannot be taken into account when making business decisions. Profits before all else.